Thermal Insulation. Why apply ReveCork cork? Climate control, thermal, elastic, multi-adhesive and ecological coating based on particles of natural cork, fibers in suspension and breathable and waterproof elastic emulsions. It can be applied with a brush, roller or sprayed. It may be applied on both exteriors and interiors. Climate control, thermal, elastic, multi-adhesive and ecological coating based on particles of natural cork, fibers in suspension and breathable and waterproof elastic emulsions. It may be applied with a brush or using an airless spray gun. To request the product warranty, this must always be reinforced with a 60-g/m2+/-3% fibreglass fabric 0.18 mm thick. Climate control, thermal, elastic, multi-adhesive and ecological coating based on particles of natural cork, fibers in suspension and breathable and waterproof elastic emulsions. It can be applied by spraying, using a hopper and continuous air compressor, of no less than 3 horsepower or spray guns for dense products. Product suitable for rustic decoration in relief on lodges, villas, cottages, or as decorative glazes. Climate control, thermal, elastic, multi-adhesive and ecological coating based on particles of natural cork, fibers in suspension and breathable and waterproof elastic emulsions. It can be sprayed on, using a hopper and continuous duty air compressor, no less than 3 horsepower output or spraying machines for dense products, then float it, by either applying with a float or trowel directly on to the wall. Ideal product for the construction sector, since in addition to evening out the support, the walls are finished with a single product. Climate control, thermal, elastic, multi-adhesive and ecological coating based on particles of natural cork, fibers in suspension and breathable and waterproof elastic emulsions. It can be sprayed on, using a hopper and continuous air compressor, with an output of no less than 3 HP. or using spraying machines for dense products. It should always be applied inside the roof, whether these be metal or asbestos cement (Uralita), so as to break the interior-exterior cold bridge. 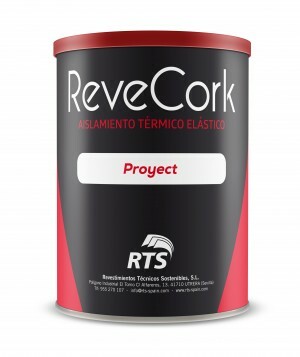 Putty, thermal, elastic, multi-adhesive and ecological coating based on particles of natural cork, fibers in suspension and breathable and waterproof elastic emulsions. You can apply it with a trowel or spatula. Do you have any questions, enquiries or suggestions?